Your height, weight, inseam measurement (crotch to floor), and body type (where you carry the fat). You will need a piece of poster board measuring about 22" x 28", found at Wal*Mart, Kmart, and office supply stores. You will also need a 22" section of #12 gauge copper wire from an electrical or hardware supply store. You will also need a measuring tape, pen, or pencil, and black magic marker. If the horse is black, you may want to use "White Out" (liquid correction fluid). Bend your piece of wire in the middle. Shape over the horse's withers directly behind the scapula (refer to picture below).Place the wire on the edge where the large shoulder muscle drops down into the withers. Make sure that it is as close to the skin as possible everywhere under the wire. If your horse has a winter coat, you may need to mousse his hair down to flatten it. Horse must be standing with weight on all four feet! Wire must be straight up and down (perpendicular to the ground), not on a slant. With the magic marker, put a mark on his hair under the wire. The mark should be long enough and noticeable to show up on the pictures you will be taking of him. When you are satisfied you have the wire bent just like his structure, pick the wire carefully off his back and lay it down on the poster board and trace around the inside of it with a pen or a pencil. Be sure to leave at least 4 inches between each tracing. Do not use the magic marker to trace the pattern on the poster board. Mark it #1 with your name AND the horses name. Measure toward the horses tail 4" from the first mark you put on the horse's hair and make another little mark. Take your wire and rebend it to conform to this second place on his back. You will repeat this procedure for a total of 5 times down his back. Please number and place your name & horse's name on each one. Please do measurements with reference marks showing on the horses first, then do the pictures. I need to see exactly where you started the first pattern. Make sure the horse stands flat on all four feet. Lay out the pattern on the poster board so that you are using the entire sheet - don't scrunch it together. Each line should be 4-5 inches apart. I need a picture taken from the side of the horse, showing the whole horse (like the picture below), showing where to make the pattern. I also need a picture taken straight on toward his head and chest and lastly, I need a picture shot downward from the top of the ladder, showing the top of his back where the saddle will sit. Write your name on the back of all pictures. 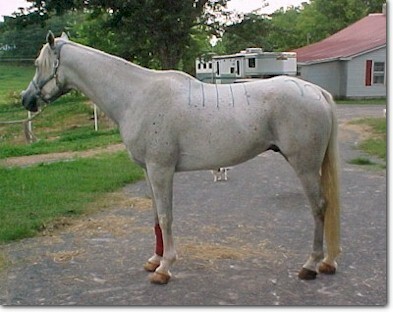 Be sure that your horse's mane is pulled forward so I can see all marks. 1. Take pictures of BOTH sides of the horse. 2. Take a picture from the rear end of the horse (looking at the tail-view). 3. Take a picture from overhead - like you are standing on a ladder looking over the top of the horse's back (when you take this picture make sure his hind end is the closest to you). 4. Take a picture of the front of the horse (with him facing you). If the saddle is for more than one horse, you will need to do this same pattern-making procedure for the other horse or horses. Please put each horse's pattern on a separate piece of poster board. I can usually hit a happy medium for a saddle to fit more than one horse, unless of course, the pitch of the shoulders and back of one horse is very different from the other. The width doesn't matter as much as the correct pitch. Yes, it can be too narrow, but if it's the correct pitch and a little wide, an extra felt pad will fill in the little spaces and works wonderfully. I need a down payment of $300 with your order and the remainder is due when we begin the saddle (the deposit is nonrefundable). Fold the poster board 2 times and mail it in a large envelope. Do not roll up posterboard and put it in a tube! If you are unsure about doing the pattern of your horse's back or if you feel that you have an extremely hard to fit horse, we highly recommend that you ask us about our newly developed Desoto mold system and complete both wire pattern as well as the Desoto mold. ***If all of this is clear as mud, try it, it's really not all that hard. If you still can't make heads nor tails of it, here is an emergency number to call: (231) 775-5612. If I'm out at the moment, please leave a message on the recorder and I will call you back as soon as I can.